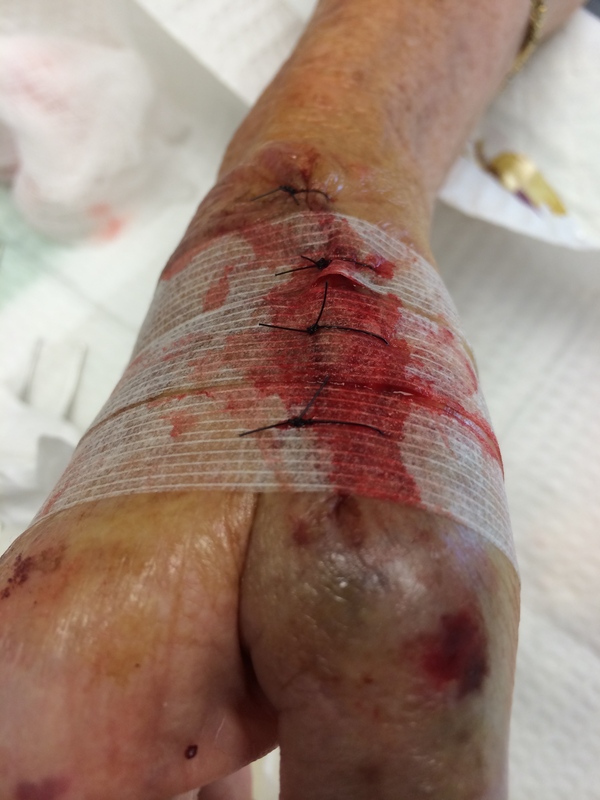 A tough situation we come across frequently in the ED is closing lacerations in elderly patients with thin, fragile skin. Age, steroid use, and certain areas of the body such as over the tibia (where skin is naturally thinner), can be factors which make a wound challenging to bring together. Adhesive tapes such as steri-strips are usually the go-to choice in these situations, but for higher tension wounds adhesive tapes don’t perform as well. Further, they have the potential to shear the skin and cause blistering when they are placed under tension. Sutures obviously hold tension a lot better, but the problem is that suturing through thin skin often times has a “cheese-wire” effect and tears right through fragile skin when under tension. This further traumatizes the tissue with each failed attempt. A solution which has the advantages of both techniques while decreasing the problems associated with each is the use of adhesive tapes in combination with sutures. There have been two separate descriptions of ways to do this, and I think depending on the shape and size of the wound, either technique can be useful. The first method, described in a correspondence in the Journal of Plastic, Reconstructive, and Aesthetic Surgery in 2009, involves laying the adhesive tape strips around each of the wound edges (without attempting to oppose two sides of the wound, thus no tension). One would then suture with 4-0 nylon sutures in the usual fashion through either side of the wound. The accompanying video documents the repair and healing of a wound closed in this fashion. The second method, described in the Journal of Emergency Medicine in 2011, involves first laying the steri-strips in the usual fashion, perpendicular across the wound edges; then suturing through the strips with simple interrupted sutures. Same effect is achieved: tension-load bearing by the sutures, but no cheese-wire cutting thanks to the steri-strips. Tissue adhesive tape is placed in the usual fashion across the wound, then sutures are placed through and through the strips to relieve tension on the skin surface. I’ve tinkered with both techniques and found them both to be useful depending on the shape of the wound. It doesn’t necessarily look elegant immediately after the closure, but remind the patient that you are taking these extra steps in the interest of improving the final outcome. Wound aftercare is a little bit different than for sutures of tape strips alone. I advise patients to keep the wound dry and avoid topical antibiotic ointments (as we often advise for sutures alone) as it can cause premature lift-off of the strips. A drawback of the technique is that it may be a little tougher for a patient to recognize signs of infection with the tape strips in the way. But overall, the technique is safe and effective with little extra work and little to lose. Give it a try! I would appreciate any comments from YOU on your experiences with this technique.